This is a fun, imaginative and creative resource designed to help children aged 7-13 get thinking and talking about their feelings and the issues that affect their lives. 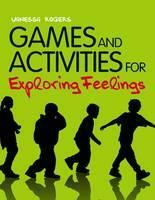 It is packed full with games and activities that help children explore their emotions and express themselves positively. Activities surrounding issues such as peer relationships and friendships, bullying, offending, participation and citizenship are designed to build self-esteem, raise aspirations and increase motivation. They will also enhance emotional well-being and develop protective behaviours, encouraging children to speak out rather than act out, and helping to keep them safe and happy. This is an ideal resource for all those working with children and looking for new and exciting ideas for games and activities, including teachers, youth workers, social workers and counsellors. This book could well help bridge the wide gap for resources for older children. Each activity is clearly explained, with sections covering the aim, what is needed and how to do it. Many of the activities include pages that can be photocopied; and fun activities include My Home, Feeling Valued, Follow the Crowd and Jealous Bag. Roger Day, Play Therapy, 2012. What makes this book so useful is that these resources are accompanied by a clear aim and methodology for using each resource, almost akin to a lesson plan. Familiarity with its contents will enable teachers / counsellors to design a programme specifically for the needs of vulnerable children. Emma Raughter, Guidance Counsellor, Kilcoole, Co.Wicklow, Ireland. Reviewed for National Centre for Guidance in Education, Winter 2012.